If I am flying to a destination or with or without children, you better believe I am only bringing a carry on suitcase. If I'm driving I still prefer to pack light and usually go with one small suitcase. With four kids in tow, it is just too much to keep track of if we have a ton of luggage, so over the years I have learned how to pack light. Atlantic Luggage with their lightweight and versatile luggage options wants to help you learn how to pack lighter and possibly even win a family trip for four to New York or LA by entering their sweepstakes. Check out the entry info at the end of this post! 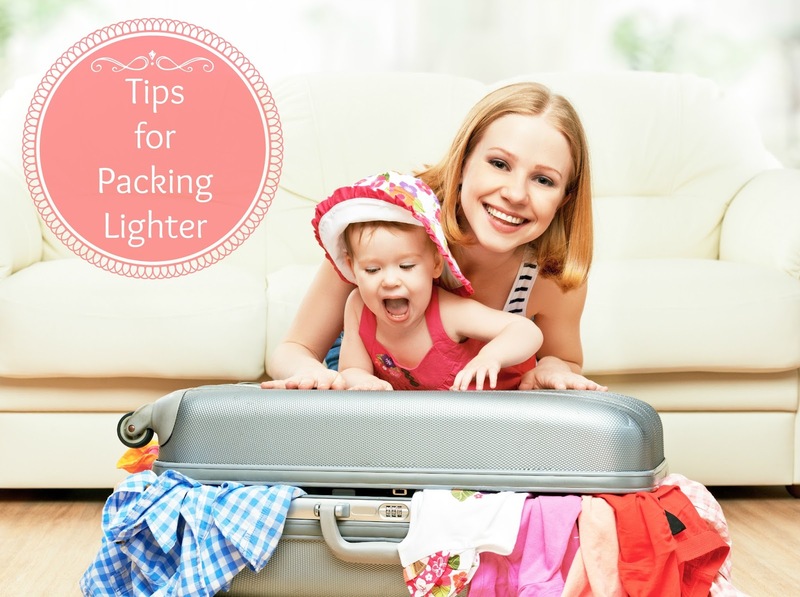 I know I have mentioned this in posts before, but it is really is the number one piece of advice I can give you to pack lighter. You would be amazed at how much more can fit in your bag when you roll your clothes instead of folding them. Plus, it helps with wrinkles. In the planning stages when you are trying to decide what to pack, take selfies of yourself in different outfit options. Then, sit down and decide which outfits are a yes and which are a no. This way, you are only packing the items that are essential for the outfits that you want, and not a bunch of extra clothing you will never wear on the trip. Try to think of items that can mix and match with others to form multiple outfits. Can that sundress easily go from day to night so an outfit change is not required? Add a cardigan and some jewelry to dress it up, and you'll see that you can get by with one less outfit in your bag. As silly as you might think is, that quality of your luggage can play a big part in being able to pack lighter. Atlantic Luggage offers lightweight and versatile luggage options with features that make it easier for families to travel together. They have a wide range of colors, styles and features like their Link2Go system that allows you to link together multiple bags for one easy one handled bundled rolling. Think how handy that would be with kids. Atlantic Luggage is roomy too, they have maximized their design to be able to fit the most items in a bag as possible. The 360-degree 4-wheel spinners allow for easy control of the bags too. So, when you're packing lighter, you can also roll smarter with Atlantic Luggage. Now through November 15th, you can Enter to win a family trip for four to either New York or Los Angeles. Grand Prize package trip certificate is valid for: (a) round-trip economy air transportation valued at up to $450 per ticket for the Grand Prize winner and three (3) guests from a major U.S. airport serviced by Delta Air Lines near to the Grand Prize winner’s home (as determined by Sponsor), to a major U.S. airport serviced by Delta Air Lines near New York City or San Diego, CA (as chosen by winner and determined by Sponsor); (b) hotel accommodations at a participating Delta Vacations hotel in New York City or San Diego, C; (c) four (4) Atlantic® carry-on sized suitcases; and (d) $300 allowance to spend on their choice of Delta Vacations Tour or Activity packages. Trip is to last three days and two nights Total prize value of $3,700. All you have to do to enter is visit the website to Enter to win a family trip, that's it. It takes maybe 30 seconds, so enter to win today! Taking outfit photos is such a great advice! I totally agree with you on these points! I used a lot of these kinds of hints when we were away last week. It saved a lot of time, and space. And yet, I STILL overpacked! I love the idea of taking selfies of your outfits before packing. Such a great idea! Thanks for sharing these great tips.